This success probably had something to do with the game's publisher, NaturalMotion, acquiring CSR developer Boss Alien. The CSR Racing phenomenon is a bit crazy. We think it's a fun game, sure, but at this point, the 52,752 five-star reviews on the App Store are a little baffling; by comparison, it only has 1,382 one-star reviews. Sure, it's a fun drag racing game, but is it that good? So good, that it pulls in $12 million per month in revenue? That isn't a misprint. 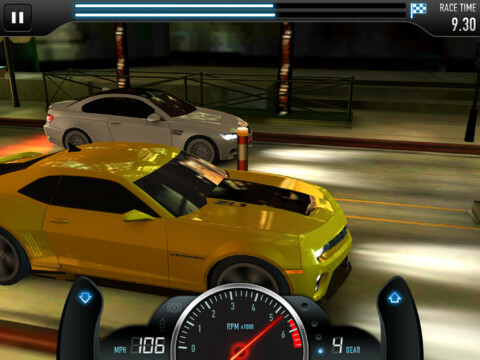 This is how much CSR Racing makes, according to publisher NaturalMotion Games Limited. In fact, the company is so impressed, it purchased the game's developer, Boss Alien. "We've been working with them from the start and they've been working exclusively with us on NaturalMotion games and they've done an amazing job a) building the game and b) creating an amazing team down there in Brighton," NaturalMotion CEO Torsten Reil told GamesIndustry International. "With this acquisition it gives us the opportunity to obviously extend what we're doing on CSR because it's off to such a great start, and in addition to that we're also growing the studio there to work on multiple projects in parallel. So Brighton is going to become an important base for NaturalMotion." And what of that $12 million? "We've achieved that figure without user acquisition, so we've done it all through organic downloads, and we think that's really really important because we think that the margin on these games are much much higher than they would be on games that rely on user acquisition to be pushed up the charts." "That's why we're really sharing this figure because it's wave two of mobile social games that's starting. Wave one is coming to an end, those were the 2D resource management games that relied a lot on user acquisition to get up the charts." Definitely impressive, to say the least.